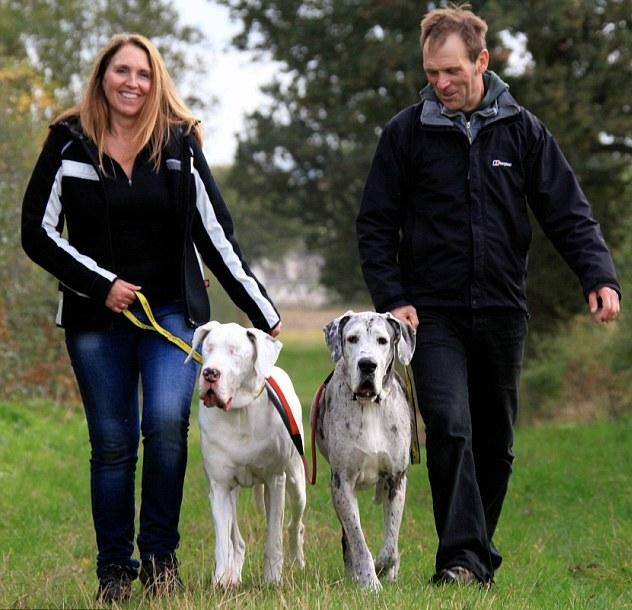 Happy ending for the blind Great Dane Lily and best pal Maddison whom found a new home. A couple Len Williams and his wife Anne, decided to take in Lily and Maddison after reading about them in the Daily Mail. There were more than 2,000 dog lovers responded by offering to adopt Lily and Maddison after reading their story. Lily and Maddison will move to Williams family 35 miles away in Crewe, Cheshire. Although, the story of Lily and Maddison is already 5 months ago, I still like to tell you that I am so glad to hear they have found a new home! We live in Holland and we received this story a week ago and because we have had a white great dane, looks exact like Lily only he was a male, called Itchy. We had him from a great dane shelter. His eyelashes were also growing in his eyes and after a week he was with us (after we picked him up at the shelter), he had an operation for this. Luckely , his sight was bad, but he had a bit sight! !, but he was also a bit deaf. Fortunately, we also had a female great dane, she took him under her wings and although she past away earlier, he enjoyed a good education from her..Unfortunately both our friends are past away now, but we have them in our harts everyday and this story made me really cry, because their looks are the same!! And a story with a happy end!! But for us it was like a returning of our great dane, Itchy. I wish all the best for Lili and Maddison and their new owners, the family Williams, please send them our love! !